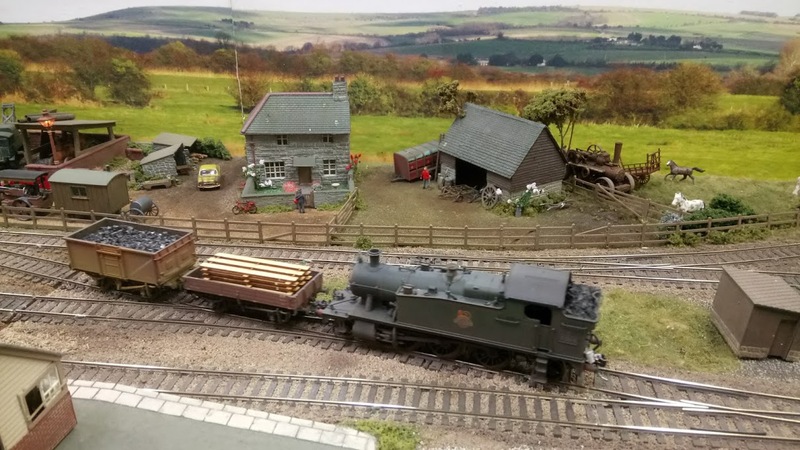 A small N gauge layout built by David Morton. This measures 6ft x 2ft and is a small through Great Western branch station set in the 1960’s with diesel hydraulic locomotives and DMU’s providing the motive power. It is controlled using an NCE digital control unit. The track plan is based on the famous Inglenook Sidings layout created by Alan Wright. It involves shunting 5 wagons out of 8 into a predetermined sequence, to a set of rules. Several versions of this layout has been produced by various people over the years. This layout measures 4ft (122cm) by 15inches (38cm). In South London the London & North Western Railway Co. built a coal depot at Knight’s Hill, close to where I used to live. Coal Depots were quite common around the country. If there was space available in the town, it was felt preferable to separate the dirty business of coal delivery from the normal goods depot. Several coal merchants would operate from one depot, each one would have their own office (hut) most of them would not store coal at the depot as it was not a secure area and they would have to pay rent to the railway company, they would unload the railway truck then either fill up the sacks at the depot and then deliver them straight away to customers around the town or take the bulk delivery by their lorry to their own yard somewhere else in the town. A HO American outline layout built by David Morton. The station is a small New York Central System depot on a branch line running between two major towns in upstate New York. Last winter a storm took out a bridge the other side of the town forcing Collinsville to become a temporary terminus. As the station was not designed to be a terminus it makes shunting the passenger and freight trains interesting. This layout measures 12ft by 2ft and is a fiddle yard to terminus plan. All locomotives are fitted with sound chips and the layout is DCC using an NCE control system. 8241 an Alco RS 3 locomotive arrives at the depot with a passenger train. 7000 a Fairbanks Morse H16-44 unit shunting a freight train. 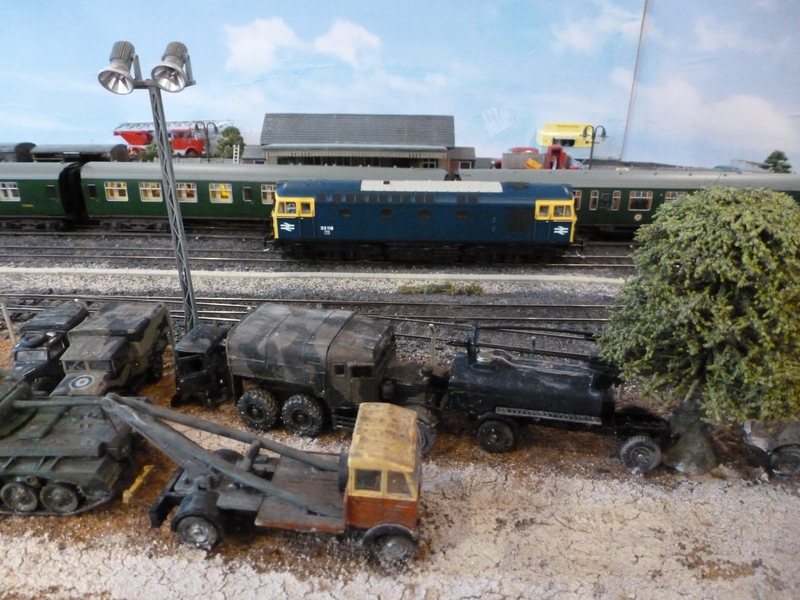 An OO gauge layout built by Stuart Carter. It is a Great Western branch line terminus layout. It measures 12 ft x 2ft. It is controlled using an NCE digital control unit. Some locomotive are fitted with sound chips. Stuart has made several You Tube videos describing how he built and detailed this layout look for “keep calm and make stuff”. 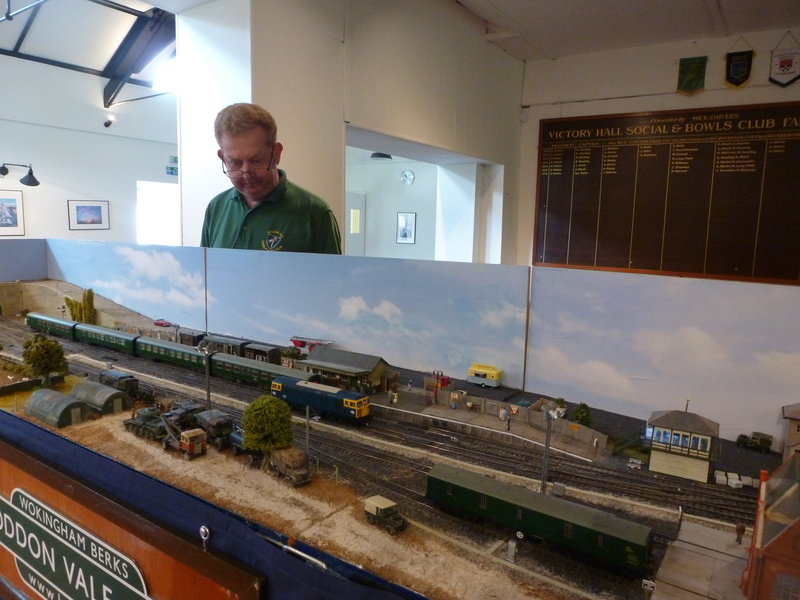 Brian Lee has built this small N gauge layout. He has managed to fit it into an old wooden Croquet set box he bought at a local auction. Brian has built this layout to show that even if you have a very small amount of spare space you can still build a layout. It is digitally controlled and some of the DMU’s are fitted with sound chips. An OO gauge British outline layout, built by Andrew Nibbs. This layout is set in Southern England with 3rd rail electric units operating into a terminus station. It took Andrew several weeks to fit the 3rd rail onto the track. There is also a military base that receives a constant supply of trains including “warwells” transporting various army vehicles. It is a DCC layout and the majority of diesel locomotives are fitted with sound chips. It measures 12ft by 2ft. and is a fiddle yard to terminus configuration. A view across to the station with a class 33. Another N gauge layout built by Brian Lee. It measures 8ft by 2ft and is a twin track continuous run layout. It is controlled using a Gaugemaster Prodigy Digital control system. Brian runs a good mix of old and modern rolling stock and attempts to keep something running all the time. 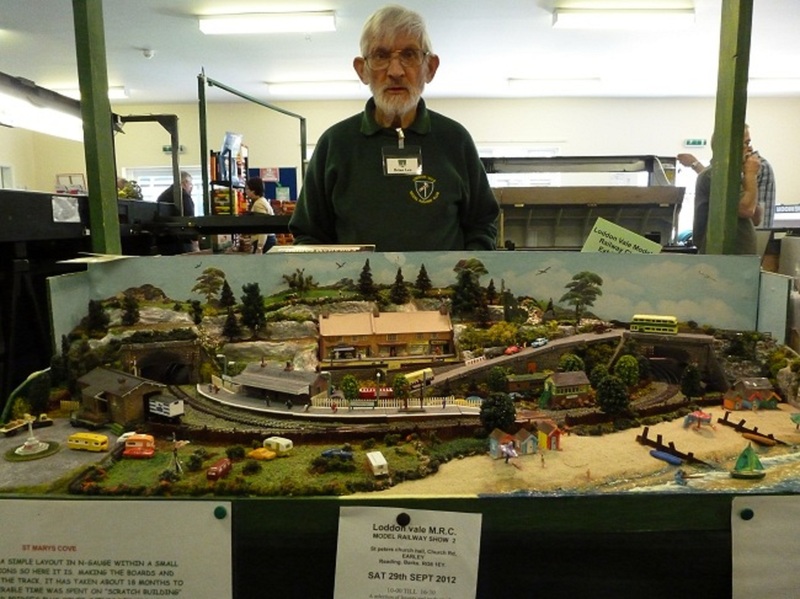 Brian loves adding small scenic details to the layout and has included a small village, disused railway line on a viaduct and a seaside scene. This is the first N gauge layout that Brian Lee made. He has tried to show how much detail you can get in a small area of 3ft x 3ft. Brian is depicting this layout as a small preserved line operating in the West Country, this enables him to operate steam or diesel trains from any era. Brian has taken great care with the scenery and has included a beach scene with beach huts and sailing dinghy’s and a caravan site. There will be some more members layouts to add to this page in the near future when they are completed.